In medium bowl toss strawberries and 2 tablespoons sugar substitute. Set aside. In another medium bowl combine baking mix, remaining 2 tablespoons sugar substitute, and baking powder. Pour buttermilk over dry ingredients and stir gently with spoon until dough comes together. Remove dough from bowl, place on lightly floured surface, and pat into a 3/4- to 1-inch-thick circle. Cut dough into 6 portions. Round each piece into a circle and place on baking sheet. Brush with melted margarine and sprinkle 1 teaspoon brown sugar over each shortcake. Bake 12 to 15 minutes. Transfer to rack and let cool slightly. 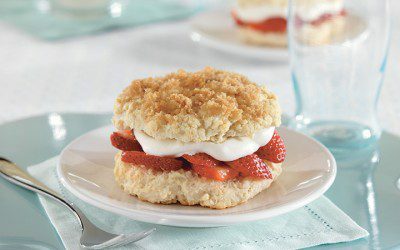 To assemble shortcakes: Split each shortcake in half. Place bottom half on dessert plates, cover with 1/3 cup berries, 1 tablespoon whipped topping and cake tops. Tip: Strawberries can be refrigerated, unwashed, for up to 3 days. Or, they may be frozen. To freeze strawberries, hull them and arrange them in a single layer on a jelly-roll pan. Place them in the freezer until they are frozen solid and then transfer them to storage containers. They will keep for up to 9 months. Exchanges per serving: 1 1/2 Bread/Starch, 1 Fat, 1/2 Fruit.